I have expertise in electrical circuitry and like to share this with individuals equally enthusiastic about electricity. 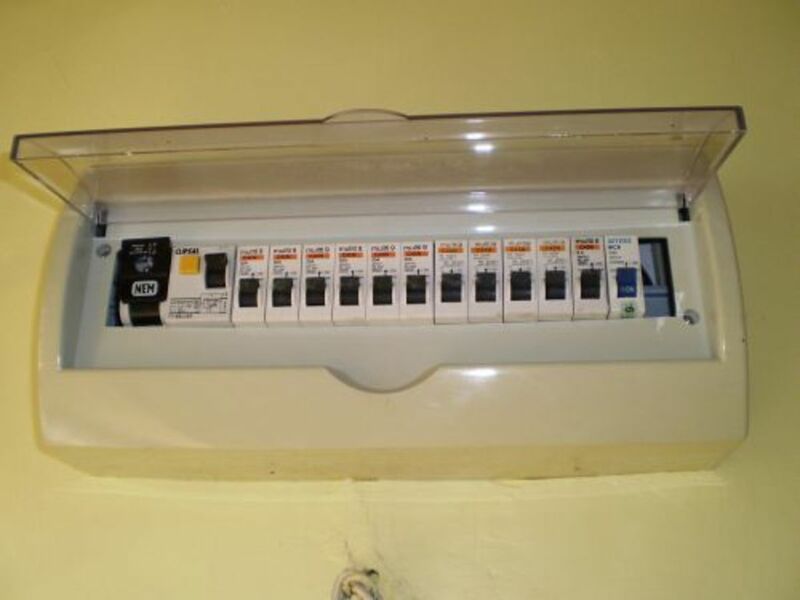 The following pictures of a house electric panel can help readers who wish to know how the panel controls electricity in the whole house. These pictures can give you a better idea of how it works. Well, this is how the electric panel looks from inside. I have removed the transparent cover of the panel. You can see how it looks with the cover somewhere at the end of this hub (Picture 14). 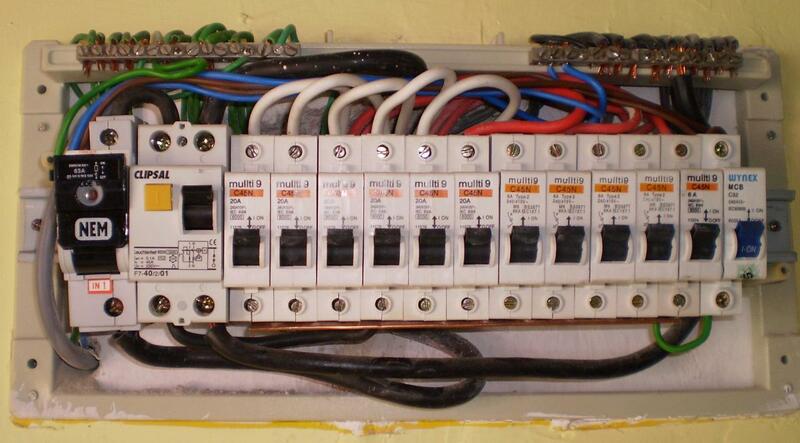 This is a modern version of house electric panel. The panel casing is made of some plastic materials. Part of the cover is usually made to be transparent so you can see without opening the cover if any of the circuit breakers have tripped. Please note that the materials I present in this hub are very basic. Therefore, readers already equipped with some electrical knowledge may want to read other more interesting hubs. Now let us go through what the electrical components on the above panel are and what purpose they do serve in the distribution and control of electricity in the house. However, before we proceed, I would like to make sure that everyone who wishes to read further knows the most basic principles in the workings of house electricity. It is very easy and the simple diagrams below will show that. What does this diagram say? There is a battery, a length of wiring cable connecting the positive terminal of the battery to one of the incandescent lamp terminal. Then there is another length of cable connecting the other terminal of the lamp back to the battery at the negative terminal. You may have played with toys that work with this very basic electric circuit when you were young. You take one AA-size battery, a pair of whatever metal wires you can lay your hands on and a small bulb. Any bulb you can dig out of battery-powered electric toys will do. Connect the battery and the bulb with the metal wires as in shown the diagram. The electricity will flow and the bulb will light up. There you have it, a working electric circuit. Electrons flow from the positive terminal of the battery through the upper metal wire (shown by the red-colored arrow) to the top terminal of the bulb (i.e. load). They flow through the bulb and come out of the lower terminal to the lower metal wire to go back to the battery but at the negative terminal. Then they flow out through the battery positive terminal again, and the same process repeats. This electrons flow round and round in the “loop” continuously at very high speed. This flow of electrons carries energy just like the water flow carry energy at the hydroelectric power station. The filament inside the incandescent lamp converts the energy contained in the continuous electron flow into heat and light. Such a long story, but where is the principle, right? The principle is that there must be a complete circuit path or a loop for the electrons to circle around in a continuous stream between the source of electricity (i.e. the battery) and the electric load (i.e. the incandescent lamp). If you break the loop at any point along this path, then the electrons will stop flowing. Therefore, the lamp will stop glowing. Just like I said, it is easy. The only problem is that you cannot see the electrons flowing in an electric circuit like you see race cars racing (flowing continuously at high speed in a loop) in a Formula 1 race circuit. But it is very similar. No flow, no show. Now let go to the second principle shown by the following diagram. Don’t worry. This is the last one. This one is the most basic principle of a house wiring installation. 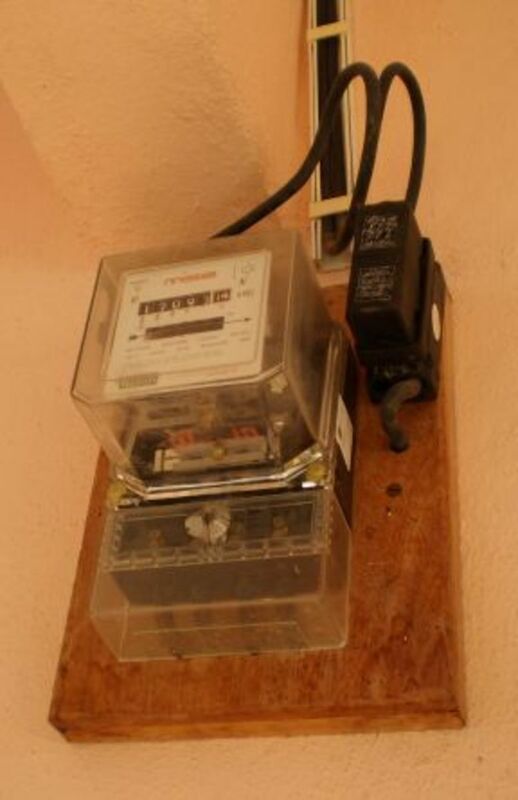 Picture 5 below shows a typical house electric meter. 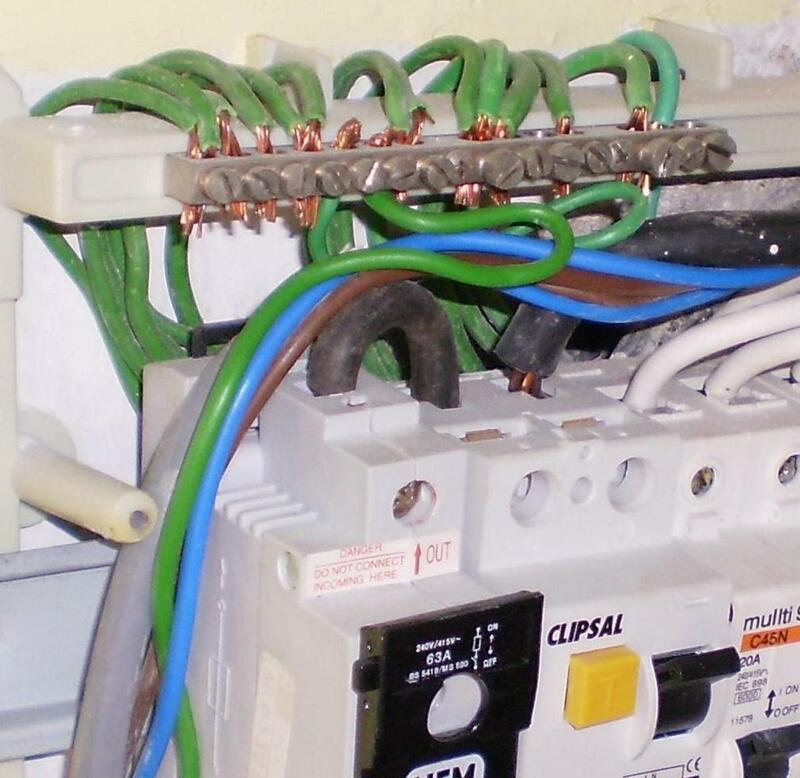 If you look closely at the picture of the electric meter, you will notice that there is actually a pair of wires connecting to the meter panel. So this satisfies the first principle above—the electrons need a loop path. 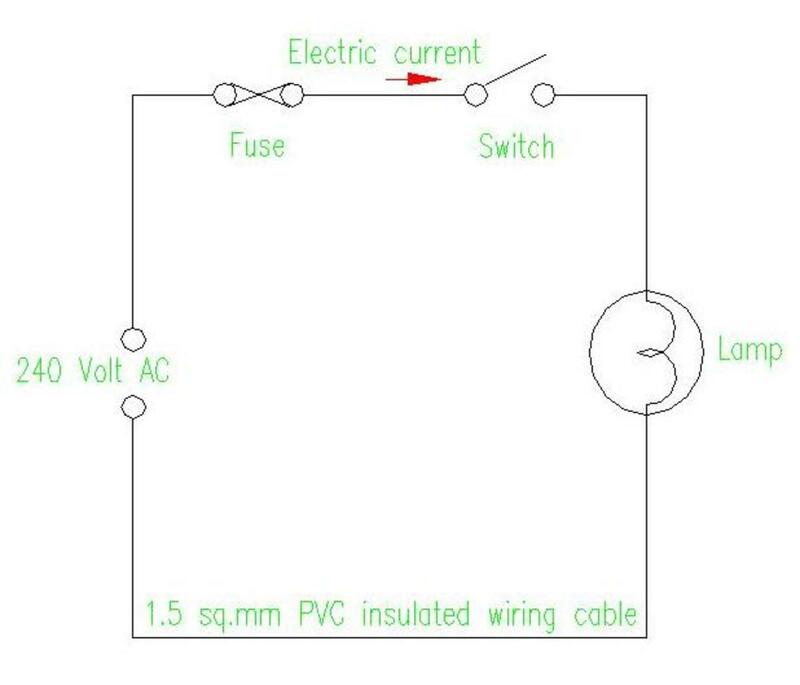 Now your source of electricity in Diagram 3 is the electric supply company who gives you the two terminal connections, just like the battery above gives you two terminal connections. With these two connections to the power source, you can make electricity work for you, right? Well, not so right. Because this time the source of electricity is so strong, it can burn a house and kill the house occupants, literally. It can kill without even causing the fire first. Therefore, to make this strong power source work for you, you need to be able to control it any time you like. You also need to be able to kill it before it causes danger or damages. You need also the ability to shut off the flow of this dangerous energy into your house if your house wiring is not prepared enough to receive it safely, or to handle it. The switch gives you the ability to control. 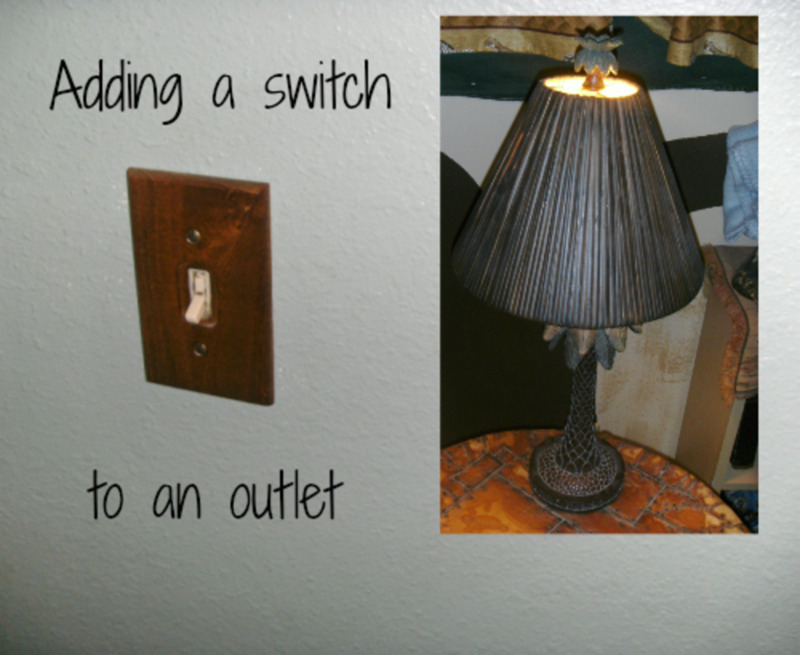 You can turn the lamp on and off with the switch. While the fuse will automatically shut off the dangerous energy flow into the house when the energy flow behavior exceeds certain limits that you have set into the fuse. These two make up the principle of a house wiring system. If you understand this, then you can understand any electric power system. Now let’s get back to the electrical panel we were talking about. I was going to explain to you about the individual electric components on the panel and the purpose that each of them serves. This can be better explained with the help of a house electrical schematic diagram. Below is one example. Let’s start with an overall view of how the house electrical system works. The start is at the bottom of the diagram, with words “From Meter Panel” in red letters. That is where the electricity supply comes from. Every house has an electric meter. That is the meter I am talking about. Picture 5 shows an example of a house electric meter. From the meter, the electric power flows to the panel through a pair of electric cables. They are shown by the red lines going to the House Electrical Panel. The red line has also been labeled “2 – 25 SQ.MM. PVC Cu CABLE IN CONC. 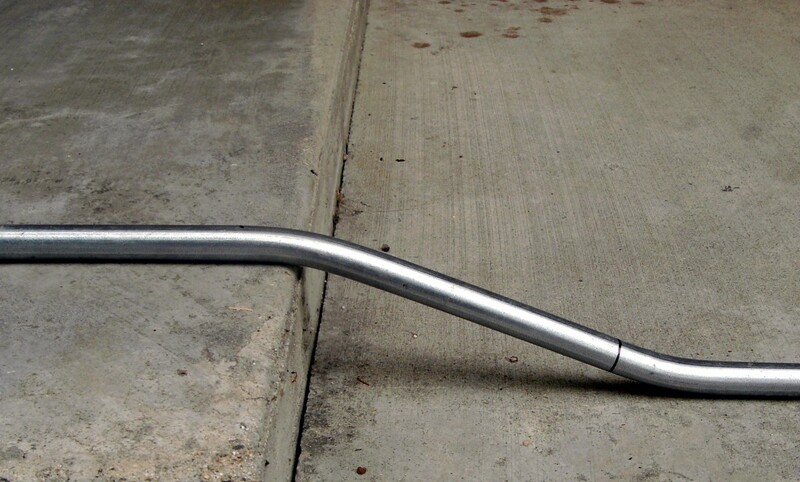 CONDUIT”. What the label says is that the supply cables from the meter panel to the electric panel are copper (“Cu” means copper) cables with 25 millimeters square in size. The size is actually the cross-sectional area of each cable. There are two of them and they are installed in concealed conduit. The word “PVC” means the cable is insulated with PVC materials, one of the most widely used insulation materials for wiring cables. The consumer electrical panel (i.e. 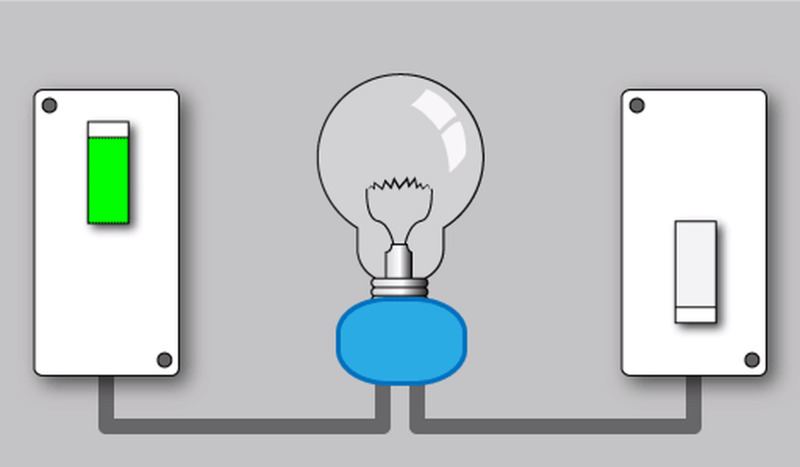 the house panel) is indicated by the biggest blue rectangle in the schematic diagram with the label “House Electrical Panel” at the left bottom corner. Every component that is located inside this blue rectangle is actually located on or inside the electric panel. That is how the diagram should be interpreted. At the house electric panel, the “LIVE” supply cable is connected to the “IN” terminal of the switch-fuse. The second blue rectangle in the diagram with the label “60A SPN SWITCH FUSE” is the switch fuse. Picture 6 below shows the panel at a slightly different viewing angle. Most of the components inside the panel are mounted on a standard rail and the switch fuse is the component at the far left (your left-hand side) of the photograph, with the letters “NEM” on it. The switch-fuse connection terminal for incoming cable is located at the bottom of the unit, and the outgoing connection to ELCB at the top. So the incoming LIVE cable will come out from the bottom of the panel to terminate at the switch fuse “IN” terminal. You can see that in Picture 6. However, for readers with small computer screen, you can probably see better in Picture 7 below. 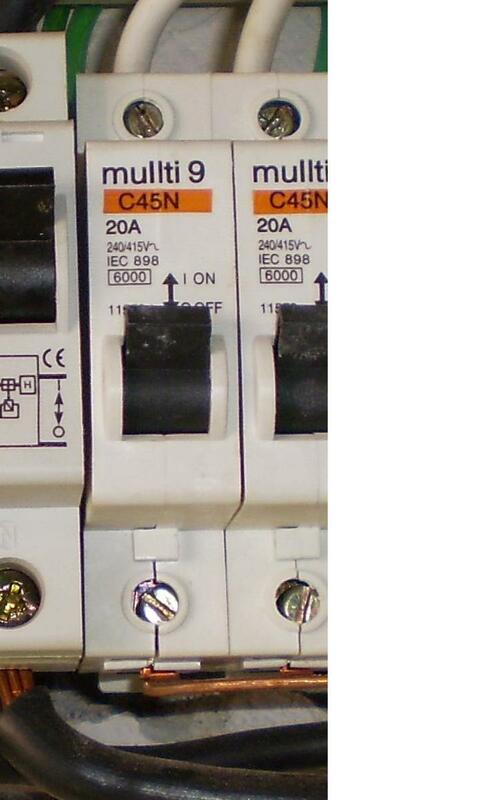 Someone out there may say that his or her house panel has another terminal near or adjacent to the switch fuse, which is for connecting the incoming NEUTRAL cable. That is also one of the common practices. The terminal that the NEUTRAL cable connects to is the neutral link. In this panel, the neutral cable goes straight to the ELCB (which is the component next to the switch fuse). I will talk about the neutral link and the ELCB a bit later. Switch-fuse is actually a combination of a switch and a fuse. Likewise, it is to function as both. You can isolate the supply to the house by switching it to the OFF position. This is what you MUST do if you wish to do some repair works to your house wiring or if you want to replace a faulty circuit breaker. Part of the switch-fuse is also a fuse inside a fuse carrier. The “60A” means the fuse maximum current rating is 60 amperes. 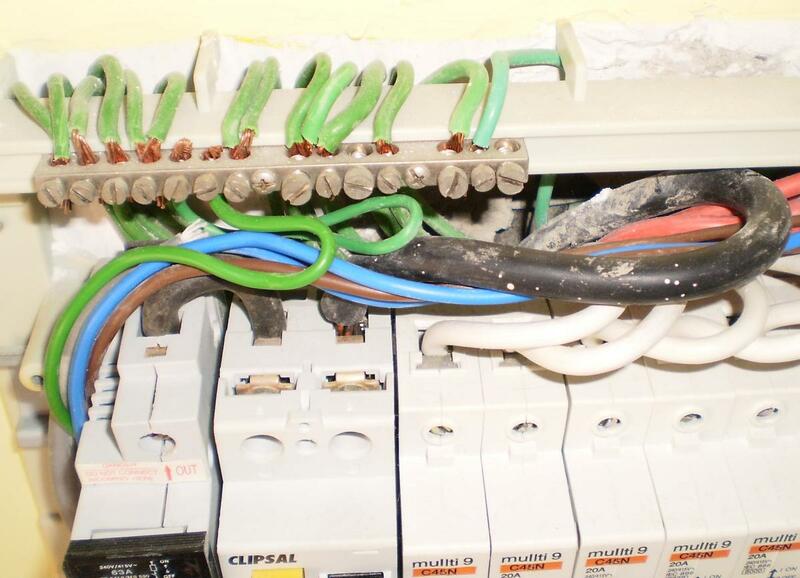 If the electricity current drawn by all appliances and equipment inside the house exceed 60 amperes, the fuse will blow and disconnect the house wiring from the supply at the meter board just outside the house. Likewise, if there is a damaged wiring that causes a short circuit between cables, the currents can also exceed 60A and the fuse will blow. This function protects the house wiring from overheating that can cause fires and protect the house electrical system from damage. After turning the switch-fuse to OFF position, you can actually take out the cartridge fuse inside the carrier. You can then keep the fuse unit somewhere else while working on the wiring. If someone switches it back to ON position for whatever reason while you are working on the wiring away from the panel, the wiring will not get energized and cause an electric shock which can be deadly. That is the switch fuse. From the switch-fuse, a cable connection is made from the outgoing terminal (the top terminal in the picture) to the Earth leakage Circuit Breaker (ELCB). This is the symbol just above the switch fuse symbol in the above schematic diagram (Diagram 4). The smaller blue rectangle has “ELCB” letters inside it. In your house, you may see that this component is called RCD, RCCB or other names. They are just variations of the technology used to design and manufacture this component. They all work more or less the same way. 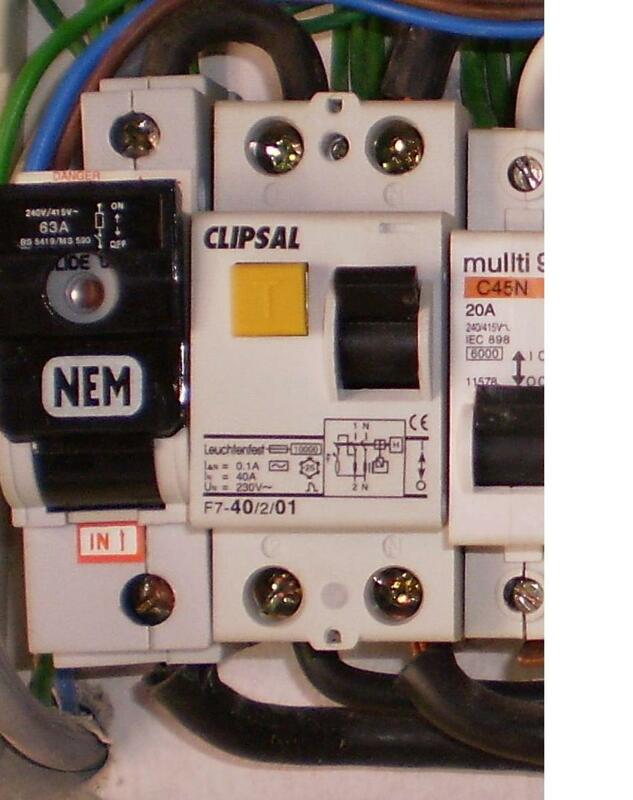 In Picture 6 above, the ELCB is the component next to the switch-fuse, with the letters “CLIPSAL” on it. A closer view of the component is shown on Picture 8 below. The ELCB protects the users from the risk of electric shocks. 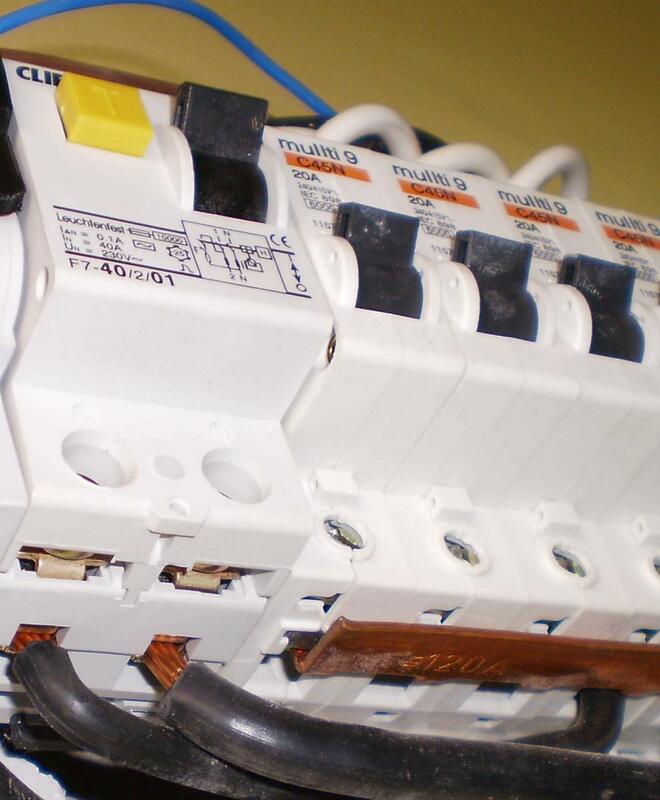 Sometimes there is damage to the wiring system or to an electrical appliance connected to the wiring, which causes a leak of electric voltage. 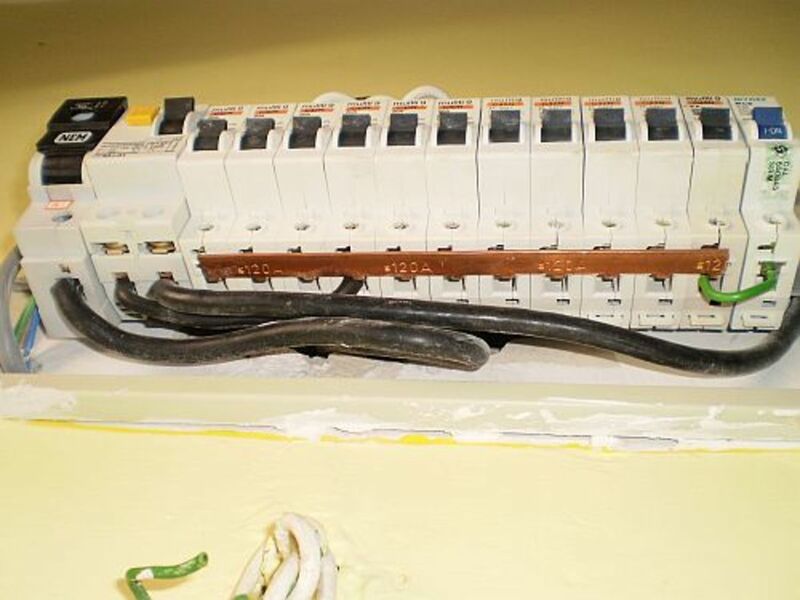 An example scenario may be an injured PVC insulation of a live wiring cable inside a house washing machine. 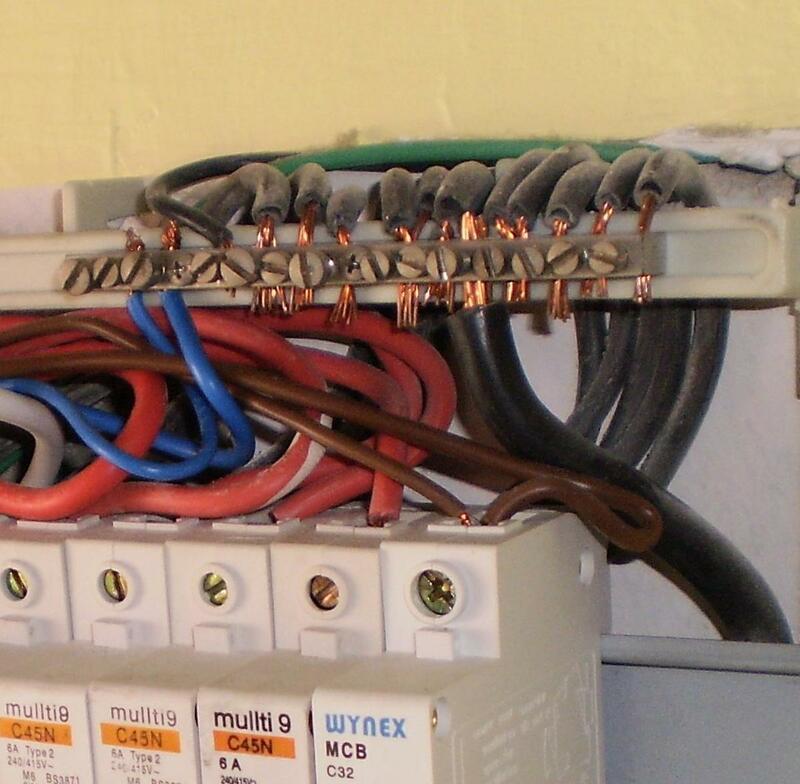 If the exposed live copper conductor (underneath the PVC insulation) somehow touches the metal casing of the washing machine, then the metal casing can be energized to a dangerous voltage level. Anyone touching the metal casing will suffer an electric shock and may be seriously injured. Death from this type of accidents is common. The ELCB can detect this leaked voltage and it will trip fast enough to prevent possibilities of serious electrical accidents. Picture 8 below shows a closer front view of the ELCB unit. You can see from the above two pictures of ELCB that there is a cable connecting the outgoing terminal of the switch fuse (the top terminal) and the top left terminal of the ELCB (Notice that the ELCB has four connection terminals, two at the top of the unit and two at the bottom). The incoming terminals of the ELCB are located at the top by design. The arrangement helps to produce a neat and very short connection between the switch fuse and the ELCB units. This is an important trait in the arrangement of an electrical system, and the wiring of its electrical components: neatness and efficiency. From Picture 6 above you can also see a longer cable connected to the ELCB’s second top terminal. This is the incoming NEUTRAL cable, which comes directly to the ELCB from the meter panel. If a neutral link is used together with the switch-fuse, then this connection to the ELCB will come from the second terminal of the fuse link. There are some details on the ELCB unit that I would like to talk about, but that may make this hub too long. So I will probably use another new hub for that topic. This hub is intended to give a general review of the components on the electric panel and provides a brief description of how they connect to each other. Now let see the next component in the path of the power flow on the electric panel. Refer again to the House Schematic Diagram 4 above. Going upward from the ELCB, the next component in the power path is a thick red-colored line. It is connected to 16 thinner branch red lines with similar symbols on them (labeled “20A SPN MCB”, or 10A instead of 20A). I took another picture with a different angle again to show you clearly what this thick read line is. See Picture 9 below. Look at the long copper-colored metal piece extending from left to right next to the black cables. This is the actual look of the thick red colored line in the schematic diagram. It is called the LIVE busbar, or the PHASE busbar. It is copper colored because it is actually made of copper, the same material that is used to manufacture the cable conductor as I explained at the beginning of this article. The busbar is used to distribute the electric current to the entire branch wiring in the house. Each of the branch wiring is protected by a circuit breaker, which is the symbol you see on each of the 16 red branch lines in Diagram 4. One of the labels says “MCB”. This is an acronym for “Miniature Circuit Breaker”. 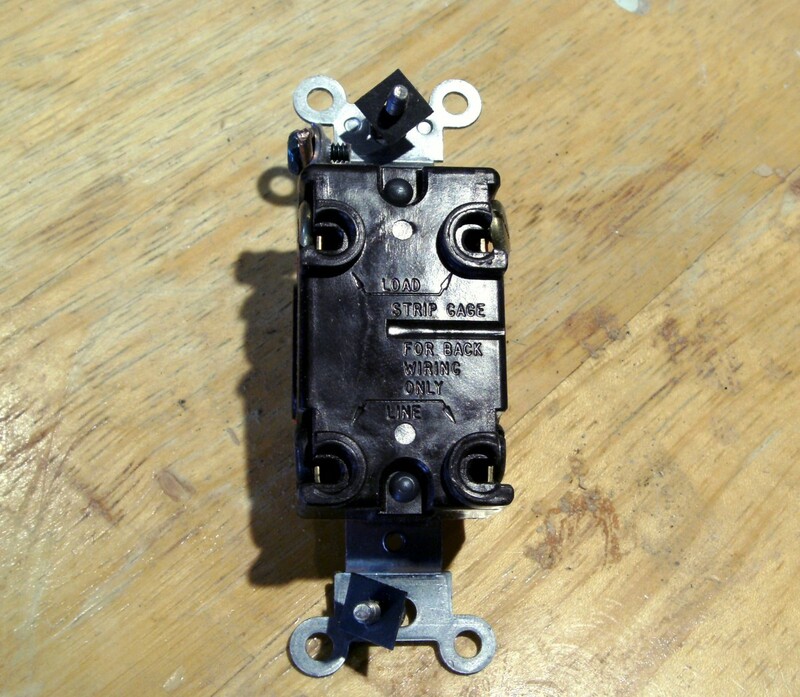 This is the most common type of circuit breakers used in a house electric panel. In the old days, fuses were used in place if these MCBs. Nowadays fuses are still used for these purposes, but modern homes use mainly MCBs. “20A” means that the maximum current the circuit breaker will allow into the branch wiring it protects is 20 amperes. If the equipment draws current more than this, the circuit breaker will trip and stop the current flow. Picture 10 below shows a closer view of one of the MCB units. Observe the label “20A” on it. SPN means “Single Pole and Neutral”. Remember that this is a normal single-phase supply, 240 volt. If an equipment in a house has a high wattage such as a water heater in a big bungalow, with say 8 kW hot water heater, then it will probably need a three-phase supply. Then the circuit breaker that protects its branch wiring would have been labeled TPN, which is “Three Pole and Neutral”. However, this house electrical panel is only a single-phase type. Therefore, it cannot be used to supply a three-phase equipment. How Is the LIVE Busbar Connected to ELCB? You guessed it; it is by one of the black cables coming out from the bottom of the ELCB unit. The other end of this cable is terminated to fourth MCB unit counted from the ELCB position. The live busbar actually has a number of teeth along its length. Each of the teeth is bent so it can be slotted into the lower connection terminal of the MCB units. You can see this in Picture 11. At the fourth MCB unit, the live cable from ELCB outgoing terminal and one of the busbar teeth is terminated together at the lower terminal of the circuit breaker. Therefore, all lower terminals of the circuit breakers in the panel (except the last one at the far right) are connected to the live busbar. The right-most circuit breaker has a little different story. It seems this MCB is an additional MCB that has been added later, after the electrical installation work has been completed. Therefore, the busbar length was not long enough to give the extra connection. So the house occupant added an extra connection wire with an insulation that happened to be green (not a very good choice of color in this case because it can be confused with earthing wires). We have covered almost all of the components on the electric panel. Now let’s go back to the schematic diagram and check if we have missed anything. As you can see in the diagram, after the MCB symbols there are only thin red lines, which are what we call final circuit wiring. These wiring cables go to the wall socket outlets and the wall switches in the house. The diagram also indicates the sizes of the wiring cables. I have shown how to interpret those labels earlier for the incoming cables. So now, the interpretation method is also the same way. Are these all the components on the electric panel? Not quite. Look at Picture 6 again. Above the ELCB unit, you can see a different type of busbar. This one has a number of screws on it for the purpose of cable terminations. As you can see, there are a number of green cables connected to it. 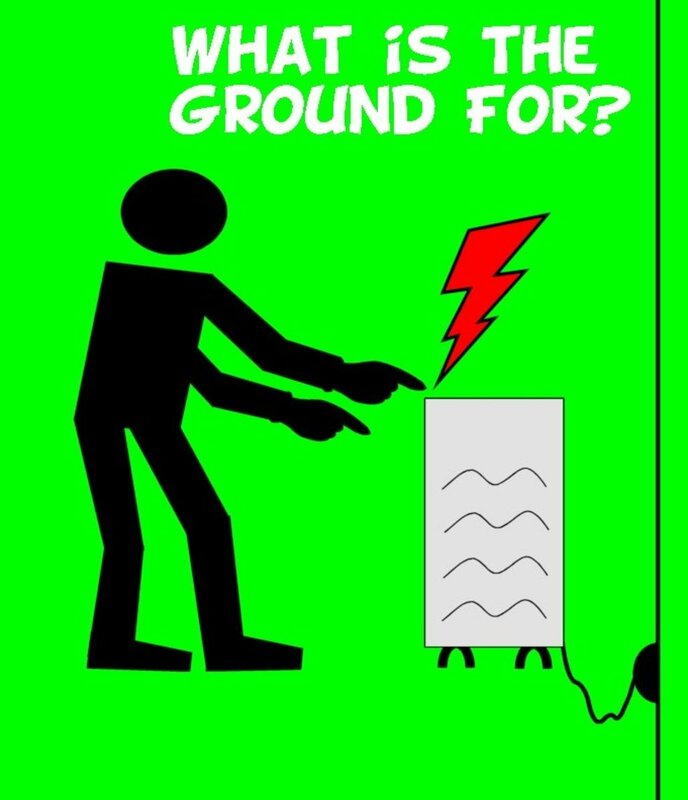 That is because it is the grounding busbar. I will not elaborate much on this topic today because this hub will then be too long. I will pick up on the grounding topic in another hub. 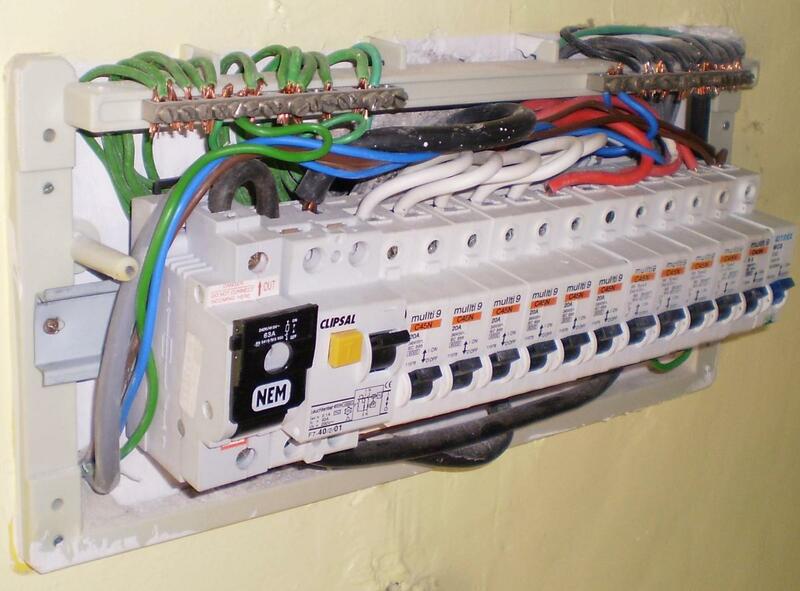 Electrical grounding is a major topic in electrical works. Suffice to say for now that the ground wiring is like the nervous system for the electric shock protection in your house wiring. 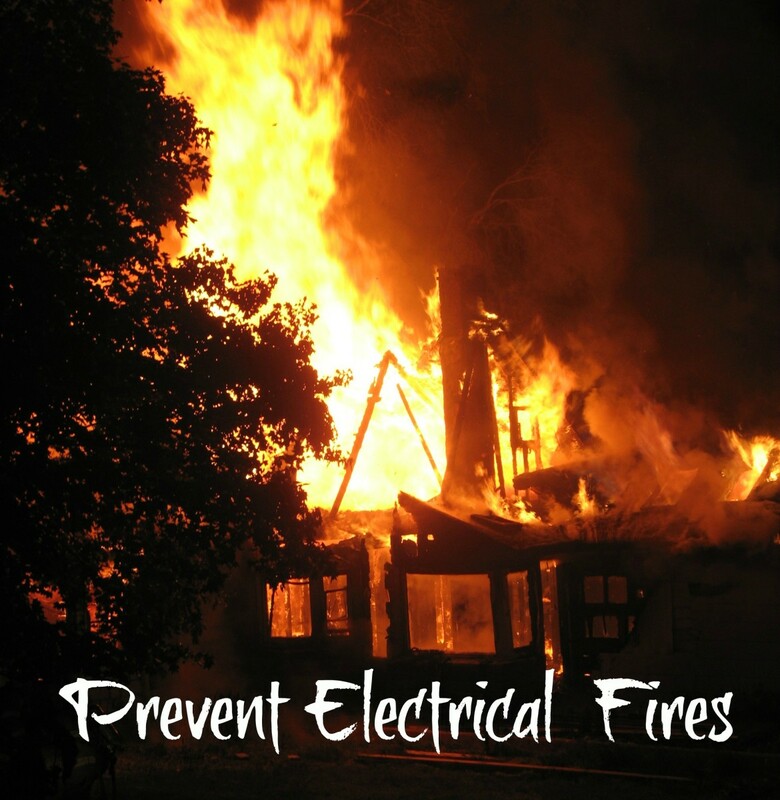 If a house electrical ground wiring is not working properly, a faulty appliance such as a washing machine can cause electric shock injuries and electrocution in the house. The risk of fatal accident is very high. It is that simple. This can happen even if the ELCB or RCD unit is tested regularly and it seems to be healthy. I already have a hub on electric shock protection. You can read that for now. I will publish a new hub soon for the house electrical grounding system. Far to the right side of the earthing busbar is the neutral busbar. Observe carefully the wiring connected to the outgoing circuit breakers (i.e. the MCBs). There is only one wiring cable there, which is the LIVE cable. One cable is not enough to make a complete loop (Remember the basic principle of electricity in the beginning of this article?). So there must be a second cable, the NEUTRAL cable, which comes out of this panel for each of the circuit breaker, right? Right. The NEUTRAL wiring cables are the black cables connected to the neutral busbar. One black cable need to be installed for the outgoing wiring of each circuit breaker. We have 12 outgoing circuit breakers on the panel. 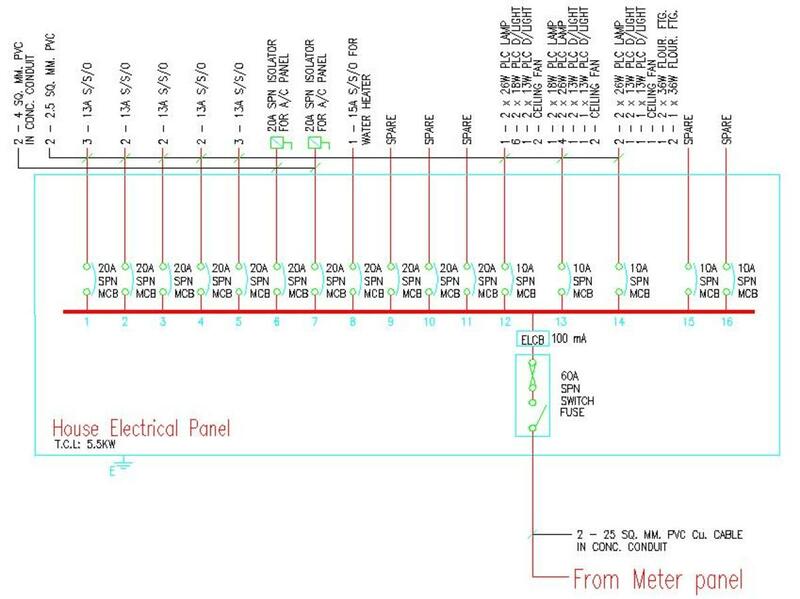 Therefore, there must be 12 neutral cables connected to the neutral busbar. 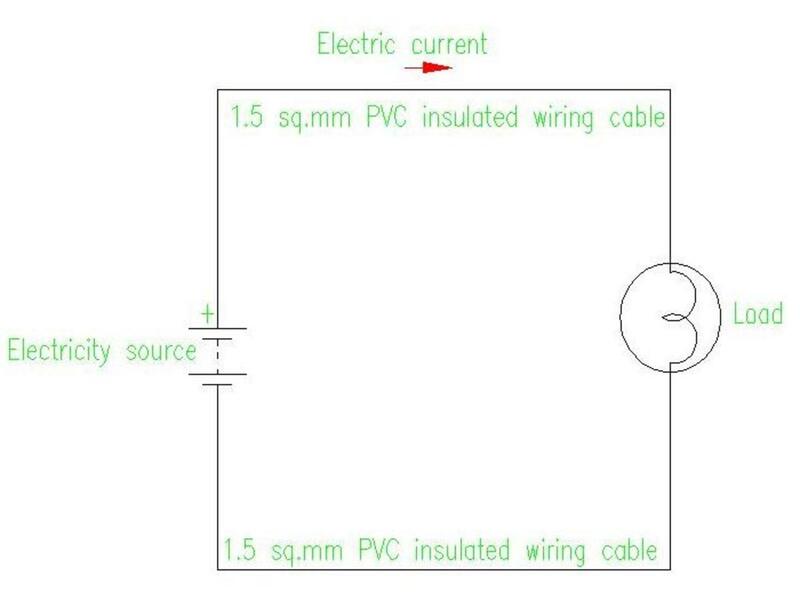 The same number should also be for the green wires connected to the grounding busbar. If the number is less, then the wiring needs to be checked by an electrician. What if the number of the green and black cables connected to the busbars are smaller than the number of MCBs on the electric panel? Can the electrical system work properly? Yes, it can with certain conditions. However, it is not a good practice and it is not recommended. So don’t do it even if you are a good electrician. This issue is a more advanced subject. So I will save it for a different article. Beginner readers may get confused if I mix them up here. Is the Grounding Busbar Grounded? With all the above pictures, you can see that the LIVE busbar is connected to the LIVE incoming cable (at the fourth MCB from left). The NEUTRAL busbar is connected to the neutral incoming cable below the neutral busbar (better seen in Picture 13). The GROUNDING busbar or the EARTHING busbar, which is part of the central nervous system for the house electric shock protection, needs to be effectively connected to the main earth mass. Without this connection, the shock protection simply will not work. Can anyone guess the connection cable to the earth mass from the pictures above? I can’t either. But don’t worry. I have actually tested the wiring and the earthing connection worked properly. I just didn’t have the time to find out which of the green wiring cables actually connects to the grounding electrodes outside the house. I think the above covers all the important components on the house electric panel. If I have missed anything, someone please let me know. I will send an update. One more thing before I close this hub. The electric panel in the picture is not exactly the same as the one in the schematic diagram. Some readers may have already noticed this by the number of miniature circuit breakers (MCBs) on the panel. However, these two panels are very similar. Only the number of final wiring circuits is different. The following picture closes this article. How to wiring for 2 DB follow Australia rules for housing. i know about 3 phase cannecton. this is very useful info bro.I know my basics now ,thanks very much man! very useful to me. Thank you.